1. Create an account on SearchIQ from our signup page. 2. Once you’ve created an account, you can login to the SearchIQ dashboard. 3. After that, you can start indexing your site. To index your site, you can follow the “Indexing” section below. 4. After your site is indexed, you can setup search bar/result page and install SearchIQ tag to the header of all your webpages. For detailed, you can follow the “Setup” section below. 5. After that steps above, your site should be good to go. 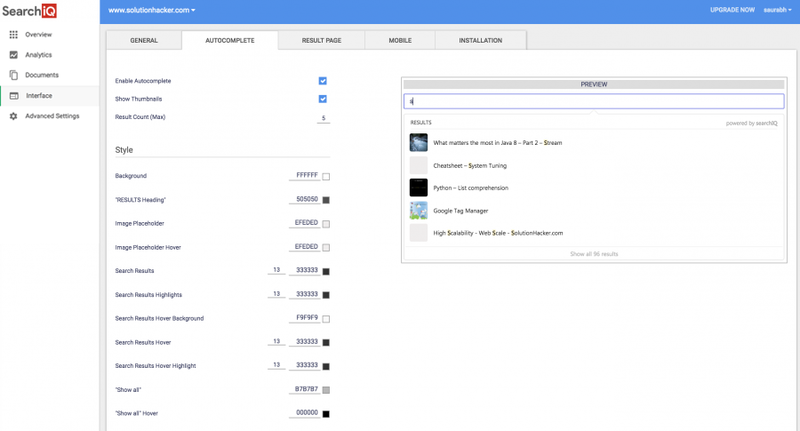 If you like to customize our autocomplete and result page, you can check out the “Customization” section below. After you login to the dashboard, you can index your website via clicking “Add another” icon from the dashboard. As your website is not WordPress, you choose “No, it is something else” button. After that, SearchIQ will inspect and see if it can find the sitemap of your site and start crawling it. For the case that SearchIQ cannot identify sitemap from your site, it will start indexing from your home page, follow any links there and continue to crawl your site with 3 levels in depth. For example, if you have a home page with menu links to subpages, your home page is counted as level 1, subpages from menu links will count as level 2 and pages that linked from your subpages will be counted as level 3. So there is chance, we may miss some pages if your site is structured deeper than 3 levels. Once SearchIQ started crawling your site, your site will have an “indexing” flash icon shown. You can refresh your screen to check again the status after few minutes. If the flashing icon is gone, it means your site is fully indexed. To ensure SearchIQ index all the pages you want, you should make sure a proper sitemap is either identified or manually added. If your site doesn’t have a sitemap, you can use this FREE sitemap generation service to generate and upload to your website then you can provide us the sitemap URL manually via “Add Sitemap” icon in Advanced Settings page. SearchIQ will run check for the sitemap URL associated to your website daily to identify any changes on your site. If there are urls with timestamp after the last index time, SearchIQ crawler will be triggered to index them automatically. For the domain that has no sitemap associated, SearchIQ will attempt to do the job for you through our site delta algorithm behind the scene. SearchIQ will only index text-based URLs. It means it will ignore media URLs like images, videos and etc. For some URLs that you don’t want us to index, you can filter them out using URL blacklist section. We support URL pattern based URL filter. 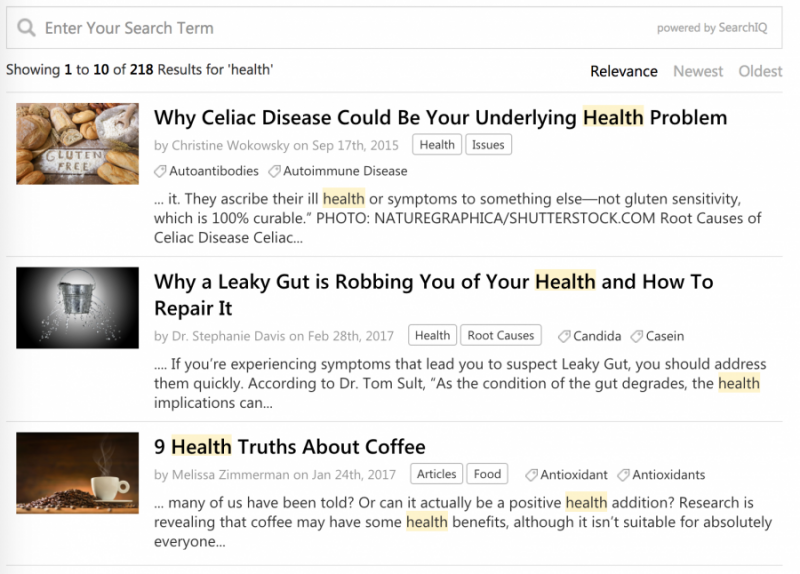 For each URL indexed, SearchIQ will automatically extracts clean text from your page that includes title, body, author and first image of the page. This text extraction is about 90% in accuracy so there are times it is not doing the job correctly. If you notice that, you can use our “Advanced Crawler Settings” section to instruct our crawler how to crawl your site properly. But it assumes you have some tech knowledges like XPATH. NOTE: For our paid users, if you have any crawl issues, you can submit a ticket to [email protected] and we can assist you on that. To support deep search, SearchIQ need to identify the entity of your page. 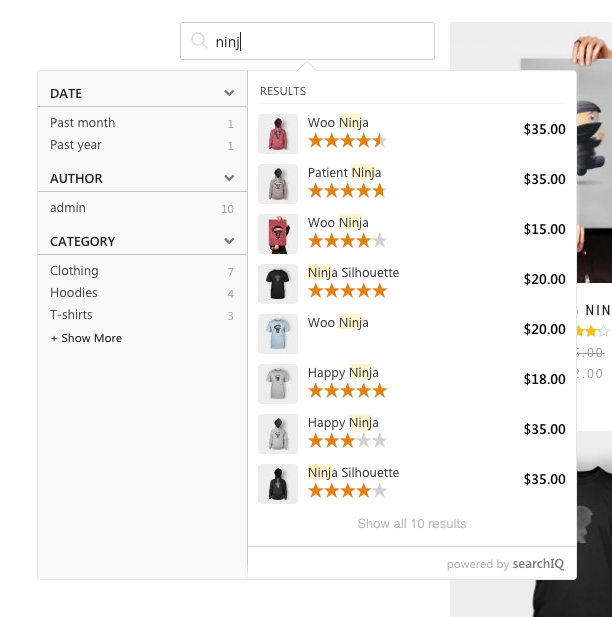 For example, if you have merchant site and you want SearchIQ to provide product-based facet search other than regular full text search, SearchIQ needs to index your page as product rather than regular post. To do that, SearchIQ will examine the metadata of your pages. 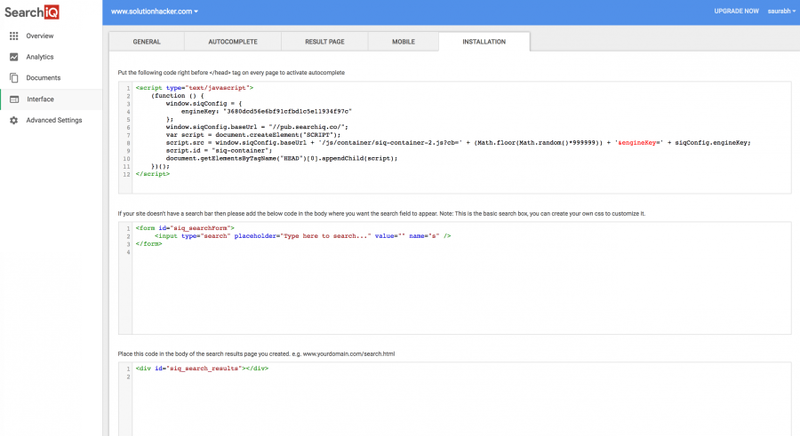 If your site already uses Google schema or Facebook Open Graph, SearchIQ will use directly. If you are not sure or haven’t got them implemented on your site, you can check this article for details. 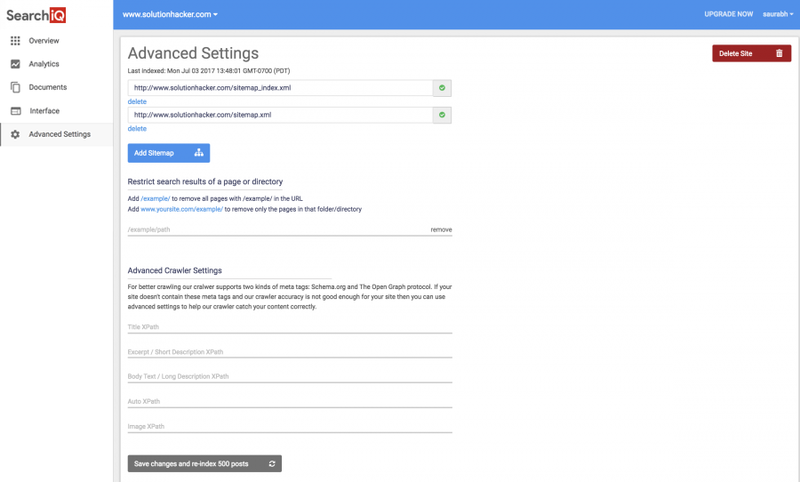 Apart from automatic metadata detection, SearchIQ will allow you to specify the field mapping manually on “Advanced Crawler Settings” page as well. So, for entity that is not supported by schema or open graph, you can use it to do the mapping. You need to specify the URL for the search result page under “Interface > Result Page”. For the URL you want to be the result page, please tell us where you want us to show the search result widget via add the following html tag to the right position of the page. 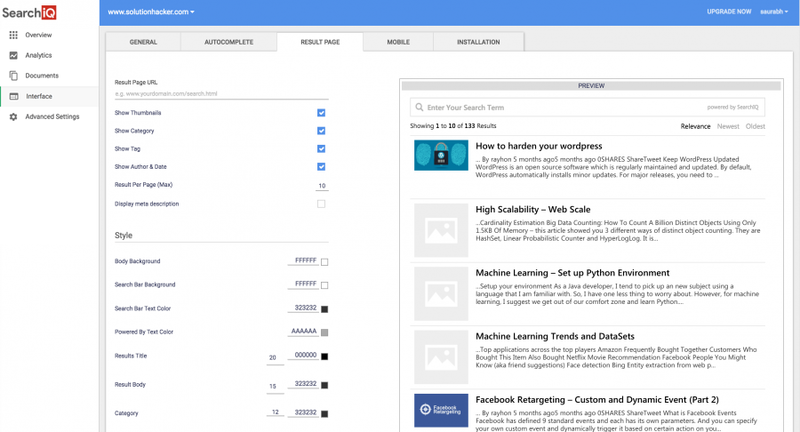 After site indexing and configuration, you are ready to see SearchIQ in action on your site. All you need to do is to install our SearchIQ tag to the header of your html pages. You can find the tag under “Interface > Installation” tab. If you have SearchIQ set up properly, you should be able to see our autocomplete and result page below. If you don’t have search bar or autocomplete is not showing up in your search bar when you type, you can follow the “Setup Your Search Bar” section of this Guide to fix it. For autocomplete, we will show title, description and thumbnail by default. If you are using our cross-domain feature, you will see the domain name as well. For details about cross domain search, you can consult our “Cross Domain Search” Section below. Along with search result, there is thumbnail. 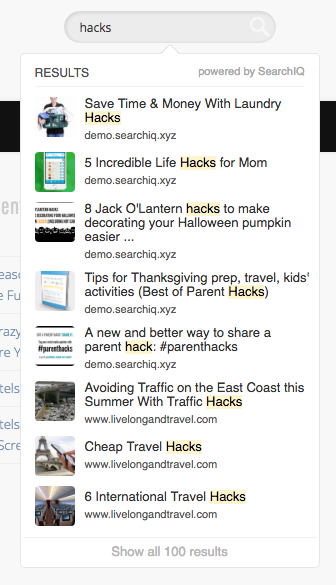 For Free account, SearchIQ will generate thumbnails in your server and serve from there. For our paid users, thumbnails are generated and hosted on SearchIQ servers and deliver through CDN for better performance and user experience. If you want to have even more fine-grained control like you want to show a post at the top of the search result for a particular user query, you can achieve this by adding the user query as a tag to your post and give “Tag” field a high weight like 9 to 10 and potentially lower the “Title” weight. This feature may not allow you to explicitly decide what rank #2, #3 and so on but it allows you to show a set of posts for a particular query. 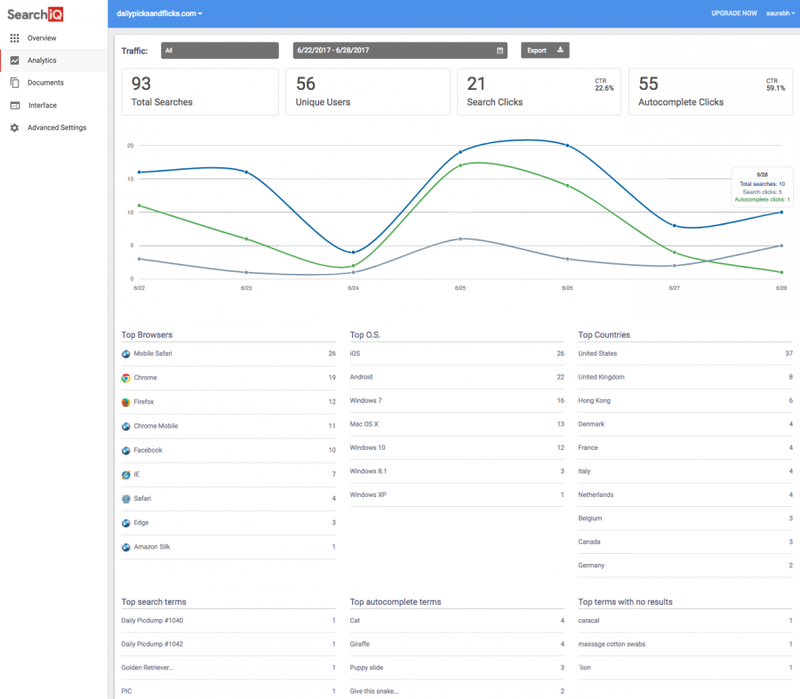 SearchIQ tracks what your users searches and clicks on your site and provides you analytic reports. To access your domain reports, login in to SearchIQ admin area, select your domain, and click the Analytics on the left sidebar. Faceted search is the dynamic clustering of items or search results into categories that let users drill into search results (or even skip searching entirely) by any value in any field. Each facet displayed also shows the number of hits within the search that match that category. 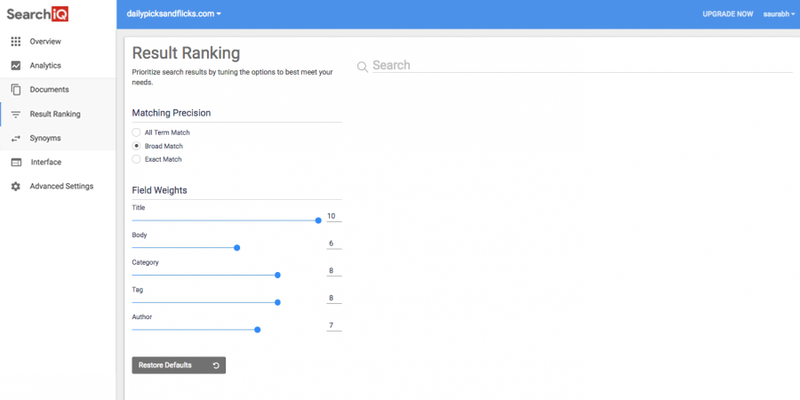 Users can then “drill down” by applying specific constraints to the search results. User studies demonstrate that faceted search provides more effective information-seeking support to users than best-first search. Indeed, faceted search has become increasingly prevalent in online information access systems, particularly for e-commerce and site search. That is why many of the large websites like Amazon already provide this feature to their users. SearchIQ can help you to add this search feature on your site in ease. The instruction will be provided once this feature is released. 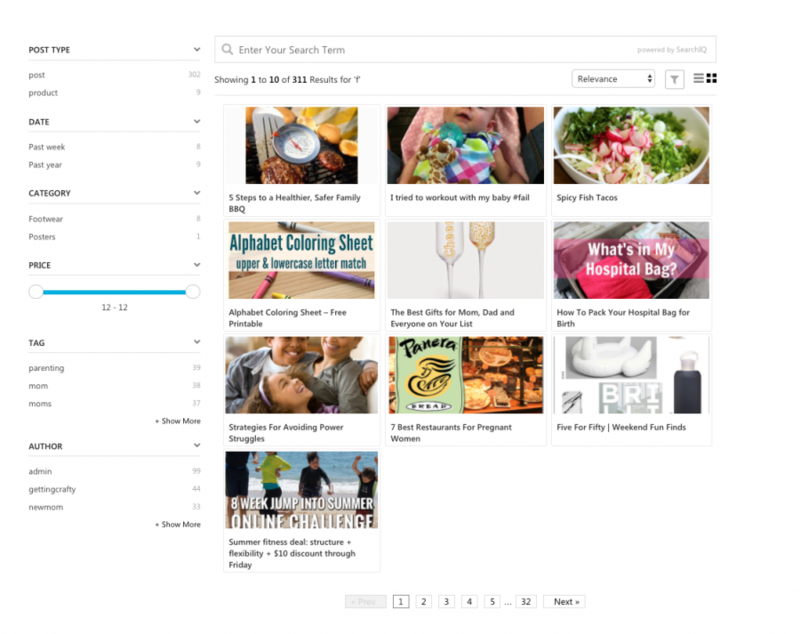 Below you can see how our faceted search in action on articles and products. SearchIQ provides WYSIWYG configuration for both autocomplete and result page widget. 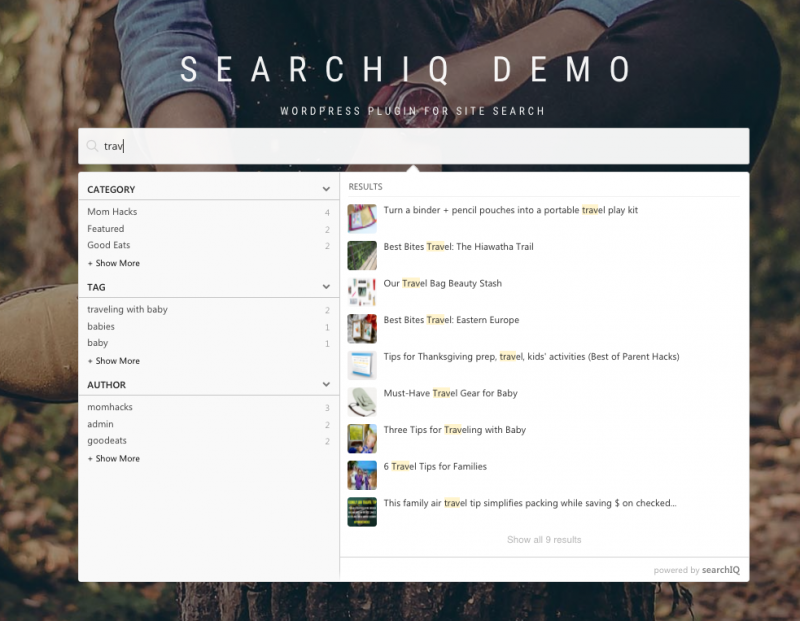 SearchIQ provides a great set of elements that you can use to customize our widgets. If these configuration setting is not enough for you to customize our widget, you can use CSS Override under “General” tab and override our css rules for the widgets.